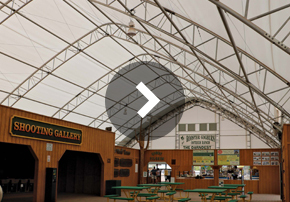 A ClearSpan construction vehicle garage provides a generous amount of height and space. No construction company can operate properly without a fully functioning fleet of vehicles, and ClearSpan construction vehicle garages provide dependable year-round protection to vehicles of any size or quantity. The clear span design of these structures doesn’t require any support columns, allowing construction vehicles to move freely and be organized in whatever manner is most convenient. ClearSpan construction vehicle garages can move along with your jobsite, so your company can stay on the go while still operating efficiently. ClearSpan can meet the standards of every construction company and can design and create a building for every construction vehicle garage need. Construction vehicle garages are supported by triple-galvanized steel frames and rip-stop fabric covers, ensuring protection from rain, snow, heavy winds, and freezing conditions. Fabric and hybrid structures allow natural light into the building, reducing energy costs all year. Natural ventilation prevents excess moisture from forming inside the building, keeping vehicles safe from water damage. There are many foundation options to choose from when selecting a construction vehicle garage building. Foundations can be built with pre-cast, poured concrete or helical anchoring. Helical anchors drill directly into the ground, creating a secure hold that avoids the steep price of excavation. While they are classified as 100% temporary, helical anchors are durable enough to remain permanent. This allows ClearSpan buildings to be taken down, transported and reconstructed in a fraction of the time it takes to build traditional wood or red iron buildings. With a ClearSpan construction vehicle garage building, it’s easy to store, organize and access vehicles whenever necessary. To find out more about ClearSpan construction vehicle garage buildings, call or Request a Quote today. After back to back harsh winters, Veerasammy recognized that something needed to be done to keep his equipment safe. 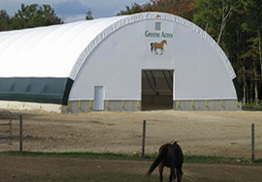 After researching multiple companies with storage building solutions online, Veerasammy came across FarmTek and their line of ClearSpan Fabric Structures. “Several factors stood out to me with these structures,” stated Veerasammy, “I liked the price, the fact that you had a choice of fabric color and I liked the multiple fabric weights.” After contacting a knowledgeable National Account Manager at FarmTek, Veerasammy elected to go with a 26’ wide by 48’ long ClearSpan Storage Master building with a dark green cover to blend with the natural colors of the woods. Our vehicle garages come in fabric, hybrid and metal buildings, ensuring that no matter how you plan on using your ClearSpan structure, there is an ideal option.